Antiochus XIII Asiaticus was one of the last rulers of the sad remains of the Seleucid Empire, which he ruled from 69-64 BC as a client king under Pompeius Magnus. 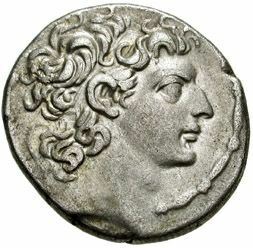 He was son of king Antiochus X and Cleopatra Selene. Some time after Tigranes had conquered Syria (83 BC), she traveled to Rome to have her sons recognized as kings of Egypt, but to no avail. Selene was eventually captured and killed by Tigranes, but after he was defeated by Lucius Licinius Lucullus at the Battle of Tigranocerta, the residents of Antioch hailed Antiochus XIII as king, and Lucullus approved his appointment as client ruler of Syria (69 BC). In 64 BC, Pompey had him deposed and killed by a Syrian chieftain, Sampsiceramus I. His death is traditionally said to have ended the Seleucid dynasty, but he was survived by Philip II Philoromaeus for a short time.